This fire station was used by the Addington Railway Workshop Industrial Fire Brigade until the Addington Railway workshops were closed and the brigade disbanded in the mid 1990s. 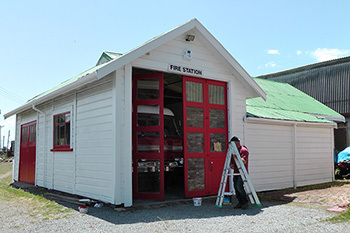 The station was dismantled and moved to Ferrymead Heritage Park where it was reassembled adjacent to the Hall of Flame Fire Museum. The recent extension of the steam train rides for the public brought the train right past the station which was exposed as a bit of an eyesore. So a team got to work replacing rotting and broken weather boards, spouting, down pipes, etc. and then a good repaint. The big front doors were beyond repair so we had to build and fit a completely new set of doors. The finishing touches have just been completed. This was quite a major project and we are very pleased at the final result. We hope the train passengers appreciate the improved scenery. Unveiling of a restored fire engine that has a huge historic significance. This appliance, a 1945 Ford V8 fire engine, was the first to arrive at the tragic Ballantyne's fire in Christchurch on 18 November, 1947. 41 people died in this fire and it is still the biggest fire tragedy in New Zealand's history. The appliance was recovered from a paddock near Helensville by Thomas Grace, a vintage vehicle collector. When Thomas realised the historic significance of the vehicle he offered it to the Society for restoration. Our team has carefully restored the vehicle from the chassis up and while Thomas and his wife are visiting Christchurch it will be with some pride that we will take the opportunity to unveil the appliance to the public. Anyone who is in Ferrymead Heritage Park at 2 p.m. on the 3rd of May is invited to attend. Our thanks to Thomas Grace for rescuing the appliance and giving us the opportunity to restore it as part of our collection. 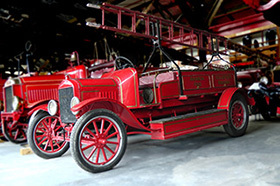 We are very pleased to have received, on loan, this Model T fire engine. 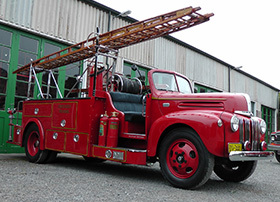 It was used by the Akaroa Volunteer Fire Brigade from 1922 to 1946. It had travelled only 500 miles when it was disposed of by raffle, which was the start of a long journey through a number of private owners until it was purchased by Phil Mauger, the present owner, in 2014. On 2nd October 2014 Phil kindly loaned it to the Fire Services Historical Society for display purposes.